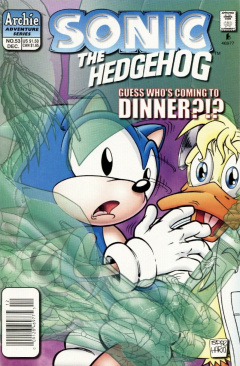 Sonic the Hedgehog 53 is the fifty-third issue of the Sonic the Hedgehog comic. This comic features two stories: "Unfinished Business" and "Sounds of Silence". Continued from Sonic Super Special 2. The residents of Knothole Village continue their work in restoring Robotropolis into their former city of Mobotropolis. Hamlin, on look-out from a nearby building, calls out to Sally and the others when he notices a craft coming toward the city. She doesn't recognize the craft, but, nonetheless, decides to run over and investigate, along with Bunnie Rabbot and Antoine D'Coolette. Antoine tries to protect the princess from any harm, but she realizes they are friendly when she sees Knuckles peeking out of the UFO-like craft, a floating vehicle used by the Dark Legion. They go in closer to help him out of the craft, along with Julie-Su, who Knuckles introduces to the group. She explains how she met Knuckles, as a Dark Legion member, but once finding out they had things in common, they became friends. Sally takes Knuckles aside, asking if they are more than friends, but he quickly interrupts her, saying that they are only buddies. The group starts to walk through the ruins of Robotropolis, discussing the issue at hand. She tells Knuckles about the Sword of Acorns, which she was able to use on her father. Although she wished on the sword to cure her father, her attempt was in vein, as he still remains crystallized. She then had Rotor examine the sword, determining that it was actually a fake. Due to this, Sally thought about going on a quest of her own to find the real sword, but because of her responsibilities in supervising the reconstruction effort, she can't. She asks Knuckles if he can, once again, go on a quest to find the real sword. Knuckles, however, has problems of his own. Having rediscovered Echidnapolis, Knuckles now has a lot more on his plate, especially since it has now returned to the normal timeline and rests on the Floating Island once again. He tells her that, by coming to Robotropolis, it gave him the time to get away and think, especially since he now has found his mother once again. Realizing that he has found his once-lost parents as well, Sally knows of somebody perfect that he can talk to. She tells Antoine to take Knuckles to Sonic. While the two walk off to see Sonic, Sally invites Julie-Su to follow her and the others back into the city to see the reconstruction effort. In a factory, while Sonic is working, Knuckles and Antoine arrive. Sonic, for once, is pleased to see him. He tries to thank Knuckles for his help in clearing his name when he was being framed, but before he can, Knuckles tells him that it is alright. The two hit knuckles together while Antoine watch, until they hear somebody shout 'Maurice!'. Sonic cowers upon hearing this, while Knuckles and Antoine are confused as to who shouted out. Jules Hedgehog walks into the factory, acknowledging Sonic as Maurice, while Sonic continues to try to hide himself. Knuckles can't believe what he is hearing, while Antoine enters a laughing fit over hearing Sonic's real name. He runs out of the factory to inform the others of Sonic's 'secret, but Sonic would rather still keep it secret, running after him. Knuckles, meanwhile, walks over to Jules, confirming if he is, indeed, Sonic's father. He confirms that, but isn't so certain Sonic still believes it. Knuckles understands, going through his own parental problems. The two walk out of the factory, as Jules tells Knuckles that every relationship has problems, and that they can be overcome. Walking into the sunset,they head back to the camp to grab some dinner. Sally and Sonic stand on a grassy cliff overlooking the large city of Robotropolis. Sally pays attention to Robotnik's old headquarters, amazed that she is now looking upon the very place where Robotnik concocted all of his plans. She also wonders if there are any more strange devices that they are unaware of in the building. Sonic tries to cheer her up by telling her that the building, and everything in it, is now her's. This doesn't cheer her up, as she releases her thoughts on now being in control of Robotnik's headquarters and city, as well as his Ultimate Annihilator weapon. She starts to walk away, but Sonic wants to know what her problems are, despite her protests. Sonic follows, helping Sally down the cliff, so she decides to reveal her problems to Sonic. She reveals that, for the first time in her life, she truly feels scared. She has gone from leading a band of rebels to commanding an entire kingdom for her father, where the kingdom is full of many problems as well. Although Sonic thinks she is done, she continues, describing the roboticized citizens who want to leave the city, as well as the mysterious time zones that keep appearing around the planet. Lastly, she breaks down and hugs Sonic, unsure if her father will ever be cured of his crystallized state. The one being, a large elf-like creature, acknowledges Sally by her name, introducing himself as Ixis Naugus. Sonic jumps into action right away, but Ixis brings out a wand unleashing a powerful bolt of energy. Sonic dodges the bolt, which crystallizes the ground beneath him. The other two beings, a large ape, larger than Ixis, and a concealed spider, stand guard, while Ixis continues to attack Sonic. Sonic, meanwhile, grabs Sally and dodges the bolts of energy. The large ape, Kodos, decides to enter the battle, bringing out his gigantic axe. Before he can attack, three bolts from Geoffrey hit the axe, knocking it out of the ape's hand. Unfortunately for Geoffrey, the spider, Uma Arachnis attacks him, knocking him out. Back on the ground, Ixis takes aim for Sonic again. He unleashes a bolt of energy, but Sonic enters into a stationary spin, causing the crystals of the bolt to reflect back at Ixis and the others, distracting them momentarily. With the trio distracted, Uncle Chuck, Rotor and Doctor Quack, recovering from the explosion, run over, telling Sonic and Sally to escape through Robotnik's secret tunnels. Rotor and Quack grab Geoffrey and lead him into the reinforced portal to the tunnels, while Uncle Chuck, Sally and Sonic jump in last, just as the door closes. Despite them having escaped, Ixis declares that he will find them, and stop King Acorn from giving them 'the truth'. The group return to Castle Acorn, previously Robotnik's fortress, to King Acorn's bedside. Although the King is still partially crystallized, he has regained control of his mind and some movement. In his bed, the Freedom Fighters inform him of Ixis Naugus and the others arrival into their realm, along with his wand being able to turn objects into crystals. They also wonder why Ixis and the others haven't started to crystallize upon returning from the Zone of Silence, like the King had. The King remarks, in a weak state, that he was hoping he would never have to hear the name Ixis ever again. Sonic, however, notes that, if they don't get rid of him, Ixis may end up being the ruler of Mobotropolis. King Acorn looks over to Sonic, declaring that Ixis is the rightful ruler of Mobotropolis, shocking everybody in the room. Doctor Quack runs over to the King to make sure he is feeling alright, but King Acorn confirms that his reasoning is sound. He starts to get out of the bed, with Sally's help, revealing that he never thought he would see Ixis escape the Zone of Silence, let alone himself. He also tells the group that, despite their thoughts, his crystallization was not due to the prolonged exposure to the Zone of Silence. To explain, he retells his story upon entry into the Zone of Silence. In such a harsh environment, he had to use all his skills to survive. After some time, that drive disappeared, as the exposure to the zone drove him into a maddening state. Due to this, he fell into a vortex that would've led to his death, had he not been saved by Ixis Naugus. Using his dark powers and the Sone's resources, he had determined a way to curb the insanity to handle the Zone. For this, the King exchanged his flesh and blood for organic crystal to become immune to the Zone, as well as becoming a knight under Ixis. The retelling of his past takes a lot out of him, so the King flops back into bed. Uncle Chuck thinks about what the King had said, meaning that, by declaring an oath to be Ixis' knight, Ixis would technically be the new King of Mobotropolis. Sally, however, doesn't believe so, as she was appointed acting ruler of the kingdom. She shouts out that Ixis must be gotten rid of, which the others agree to. Shortly thereafter, an explosion occurs, destroying a nearby wall in the castle's chamber. Sonic looks at the debris, noticing a crystal shard. He tells the castle guards to stand down, but they run into the smoky remains of the explosion for their King and country. The guards are unable to stop Ixis and the others, as Kodos runs in, asking for his next challenge. Sonic jumps in, and they start battling, but Ixis wants the battle won quickly so they can get to the King, who is being wheeled out of the chamber by the other Freedom Fighters. Sonic is barely able to avoid missing Kodos' axe attacks, while the King and the others have another problem, as Uma intercepts them. She prepares to smash the King with her nun-chucks, but Geoffrey jumps in and grabs the King, avoiding the attack. He goes for the attack, but notices his wrist bow missing. Rather, Sally has the bow, which she uses to launch King Acorn's bed cover over Uma, confusing her. ...only resulting in his hands and feet being crystallized. This makes Sonic realize that the staff can only affect two things: inanimate matter and his followers, hence why he would only fire the wand at the ground in front of them instead of directly at them, to avoid revealing this secret. With his legs still uncrystallized, he runs circles around Ixis, confusing him, and allowing Sonic to grab the staff. He throws it at the ground, smashing it. The effect of this turns Sonic's hands and feet to normal, while causing Kodos and Uma Arachnis to disappear into crystallized dust. The group then look over to Ixis, who has disappeared as well. Sonic believes that he is still alive, but that they must continue on with their efforts to rebuild their kingdom. Sonic's real first name, Maurice, is first mentioned. Ixis Naugus is shown for the first time, though mentioned in prior comics, along with Kodos, Uma Arachnis.